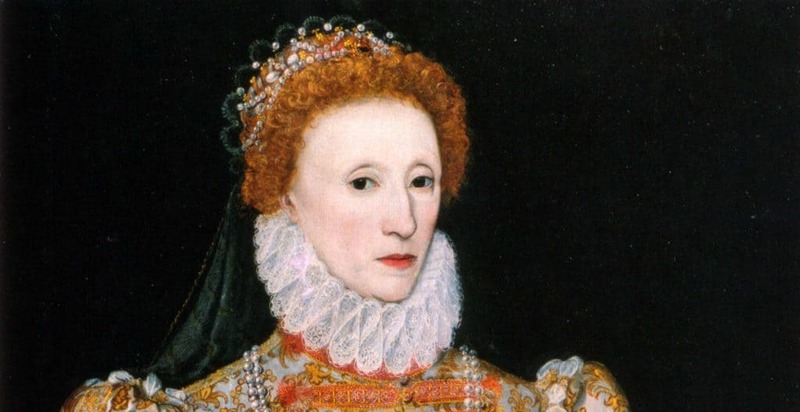 Elizabeth I gave her name to a golden age of poets, statesmen and adventurers. Known as the Virgin Queen, or Gloriana, her union with her people became a substitute for the marriage she never made. 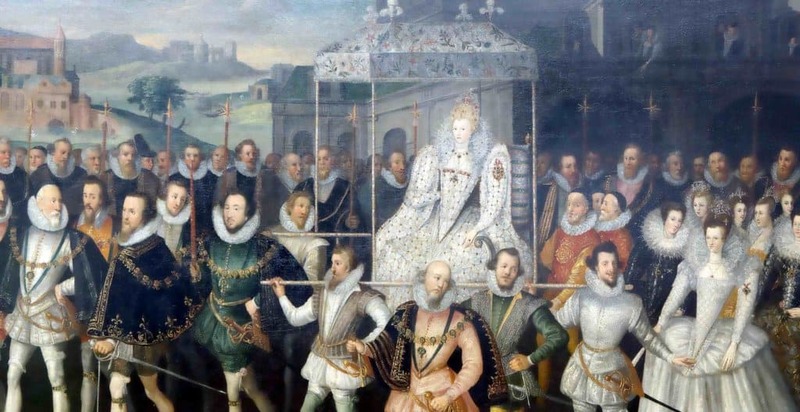 Her reign, known as the Elizabethan Age, is remembered for many reasons… the defeat of the Spanish Armada, and for many great men, Shakespeare, Raleigh, Hawkins, Drake, Walsingham, Essex and Burleigh. She was endowed with great courage. As a young woman she had been imprisoned in the Tower of London on the orders of her half-sister, Queen Mary I, and lived in daily fear that she would be executed as her mother, Anne Boleyn had been. Elizabeth, unlike her sister Mary, was a Protestant and declared when she became Queen ‘that she did not make windows into men’s souls’ and that her people could follow any religion they wished. She was a great beauty in her youth. She had hazel eyes, auburn hair and a white skin, a striking combination. But in her old she became quite grotesque in appearance in a red wig, with a white pockmarked face and a few black rotten teeth! She was also noted for her learning, and although she was sometimes wayward, she was generally considered wise. She loved jewels and beautiful clothes and had a hard sceptical intellect, which helped her steer a moderate course through all the conflicts of her reign, and there were many! Her speech in 1588 to her troops at Tilbury, drawn up to repel the Duke of Parma’s army in the year of the Spanish Armada, is often quoted. One part of the speech is well known, and the section that starts… ‘I know I have the body of a weak and feeble woman, but I have the heart and stomach of a King of England too and think foul scorn that Parma or Spain or any Prince of Europe should dare to invade the borders of my realm’, is stirring stuff even today, many centuries later. Her courtiers, and to some extent her country, expected her to marry and provide an heir to the throne. She was courted by many suitors, even her brother-in-law, Philip of Spain, joined the throng of men hoping to win her affection! It is said that Elizabeth’s great love was Lord Dudley, later to become the Earl of Leicester, but her faithful, brilliant minister and close advisor, Sir William Cecil, advised against it. Elizabeth could be hard when the circumstances needed a strong hand, and when Mary Queen of Scots (left) was found to be involved in a plot to usurp the throne, she signed Mary’s death warrant, and Mary was beheaded at Fotheringhay Castle in 1587. She could be forgiving too. John Aubrey, the diarist, tells a story about the Earl of Oxford. When the Earl made a low obeisance to the Queen, he happened to let go a fart, at which he was so ashamed that he left the country for 7 years. At his return the Queen welcomed him and said, “My lord, I had forgot the fart”! There are many stories about Elizabeth that reveal her strengths and very occasionally her weaknesses. When the Earl of Leicester gave the Queen his excuses for failing to subdue Cork in Ireland, Elizabeth’s comment was ‘Blarney’! At her death in 1603 Elizabeth left a country that was secure, and all the religious troubles had largely disappeared. England was now a first class power, and Elizabeth had created and moulded a country that was the envy of Europe.